I took two novella length works for my plane reading when going down to the Continuum convention in Melbourne. Horn and Bleed by Peter M. Ball were published by Twelfth Planet Press a few years back. Both have the same main protagonist, who is a burnt out ex-cop with a strong connection into the world of the fae. I enjoyed both works, I liked the hard boiled main character, the story lines were entertaining and moved along at a good pace. I think both could have stood to be a little longer, but that is probably because I was enjoying them and didn’t want them to end quite so quickly! I also read the latest Jim Butcher novel, Skin Game. What can I say, I like the series. Not much really to add to previous reviews – this one was a heist novel, moved along at a good pace and I liked the unexpected plot development towards the end involving a particular kind of sword. I think the novels are starting to overly rely on the intervention of the Christian God, with a little too much “let me explain away this giant coincidence that resolves the novel in a very convenient way by invoking one religion’s God and his/her ineffable plan” for my liking. But hey, when you back your characters into the kinds of corners that Butcher tends to, you probably need an all powerful deity save the day. Apart from that I’m still working on Ancillary Justice and Winter Be My Shield. I’m enjoying both books but not getting a lot of time to read. On the TV front, I started watching the new series of Defiance which is being fast tracked from the US on Foxtel. I enjoy the show – feels like a well used universe and I like the interactions between the alien races (feels a bit like Farscape from that perspective). Will be interested to see where they take the season this year. I’ve also been watching the new season of Archer – Archer: Vice. Ah, Archer. So problematic. So funny. Continuum is a good Canadian sci-fi series, well worth checking out. I’ve also been watching the remake of The Tomorrow People, but mainly in solidarity from vague but fond memories of the series from my youth. I don’t necessarily recommend it. That’s all for this month. Stay tuned. Look, I like the Dresden Files series. I understand that there are some problematic aspects to the writing, that they don’t subtly explore the human condition and that they don’t extend the genre in innovative new ways. The books are very old fashioned action stories, in a “how much damage can the lead character take and keep on ticking” kind of way. Think Die Hard but with spells. 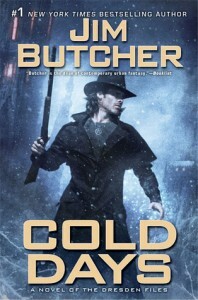 Cold Days is the 14th book in the Dresden Files series. If you haven’t read any (and this is not the jumping on point if you’re new), Harry Dresden is Chicago’s only wizard for hire. Down and out, unloved by the wizarding establishment, treated with suspicion by the police – the series started with Dresden as a noir style private investigator, with a paranormal twist. Over the course of 14 books Butcher has steadily raised the stakes and extended the scope of Dresden’s adventures to almost unrecognisable levels. The world building has been extensive, cohesive and in a lot of ways very impressive. The various warring factions are well thought through. I assume Butcher hadn’t mapped out all 14 novels when he started out, but he’s been able to “retro-fit” a lot of world building so the previous stories make more sense as he builds more backstory into the later novels. It would be interesting to go back and read the first couple of novels to see if there are any glaring inconsistencies that time has dulled in my mind. I won’t, because my to-be-read list is scary enough without adding in a Dresden Files re-read. But it would be interesting. While a few of the more recent Dresden books have felt a bit “papa needs a new swimming pool”, I’ve enjoyed the last couple of books. Butcher shook things up in the last novel (Ghost Story) and the consequences of those changes are still playing out in Cold Days. There is probably not much point in going through the plot – if you read the Dresden Files you’re going to read the book no matter what I say. If you don’t read the Dresden Files, you should be starting way back towards the beginning. I did want to comment on the evolution of female characters in the series. The Dresden Files series is told very tightly from Dresden’s point of view, so you don’t get any direct female perspectives. At the start of the series, I felt that the way women were described/characterised was the big flaw of the novels. To be fair Butcher has evolved some very strong and interesting female characters over the years, and the perspective of his protagonist has become a lot less patronising/patriarchal as he has grown. Having said that, Butcher has to have some of the most blatant “male gaze” physical descriptions of female characters I think I’ve ever seen, and that was particularly evident in this novel. I understand that given the point of view character is male and under the influence of some primeval forces in this story in particular, there is some justification. But considering Dresden spends most of the novel taking major beating after major beating, I’m surprised how often he stops to check out someone’s “physical assets”. I wouldn’t have the energy in his position, I’d be too busy saying ‘please stop hurting me’. Look, high literature it ain’t but I’m always going to grab the latest Dresden Files novel almost as soon as it comes out. If you like your fantasy urban, your action fast paced, your violence uber and your wizards… well, wizardy then this series could be for you. If not, well, there are plenty of other fish in the sea! (1) Yes Sean I know, even less genre cred points. I must be down below level 10 by now.